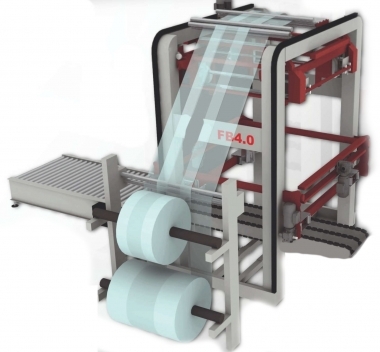 The CSH4 stretch hooding (bagging) machine applies tubular stretch films from 20-160 micron to most loads. Film is drawn from a reel, stretched and applied to the product. When the film is released it recovers naturally, tightening around the pack providing stability, protection against dust and water, witha printed logo if required. Very compatible with fast production of white goods. For certain products, a top cap or sleeve can be suitable, requiring still less packaging! Up to three tube sizes in automatic.